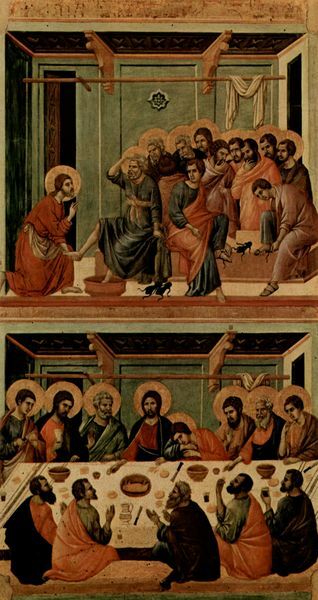 On Holy Thursday it is appropriate to stop and think about these events and their meaning for us as Christians. The cross is important, through death on the cross the powers of evil are vanquished. The kingdom of God triumphs over the kingdoms of this world. But in a real sense this victory comes when resurrection defeats death and with it the violence and depravity of this world. A sacrificial death alone is not enough. The Christian claim and hope of resurrection is central to the faith. The death of Jesus sounds like such a great story of sacrificial love until the resurrection. What a disappointing turn of events! Who wouldn’t go through crucifixion if afterward they would be resurrected and given all power in the universe. It’s no longer about something mature like love but rather about power, and for the Christian being on the team that has all the power and access to eternal paradise. Such a story reminds me more of something I’d see on Saturday morning cartoons … forces of evil battling against the forces of good … than from a wise creator. How would you respond to this criticism? The question posed by the commenter penetrates to the purpose and meaning of the chain of events leading from incarnation to resurrection. Resurrection is a surprising outcome following the incarnation and crucifixion. It changes the story. But does it trivialize the story, removing the element of sacrificial love from the picture? Another common story line – somewhat different from the forces of evil battling the forces of good – focuses on (individual) human sinfulness and the need for divine satisfaction through blood sacrifice. Crucifixion satisfies divine wrath. But again this story line could be viewed as something of divine playacting – after all, the outcome was never in doubt. The divine son was never consigned to death, it was merely a temporary state on a path to inevitable resurrection and ascension. My gut feeling is that there is something deeper going on than either of these narratives portray, although I remain unsure how to express it. The revolutionary claim of resurrection is not peripheral to the Christian faith – something that can be accepted, rejected, or spiritualized. It is not that He lives within my heart but that He Lives whether hearts are receptive or not. And his death and resurrection accomplished something powerful. Paul, when writing to “the church of God in Corinth, to those sanctified in Christ Jesus and called to be his holy people”, not preaching to unbelievers or those not yet in the church, found it necessary to emphasize the importance of resurrection. In some sense, though, the claim of Paul at the end of this powerful passage in 1 Cor. 15 and elsewhere ( c.f. Phil. 2:5-11 and Romans 8:31-39) comes right back to the commenter I quoted above. This is a story of power. And resurrection is the victory over the power of sin and death. But how should we understand and speak of this victory? How is this resurrection part of the mature love of a wise creator? You may also comment on The Power of Resurrection? at Jesus Creed. This entry was posted in Resurrection. Bookmark the permalink.